Famous quotes make for terrific signs! We have movie quotes, quotes from TV shows, quotes by famous athletes, funny quotes, heartwarming quotes, quotes by famous authors, quotes from politicians, and more! 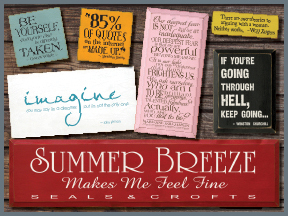 With over 40 colors to choose from, your solid wood sign from Sawdust City will look great anywhere!